Hunger strikes. These were the last resort for Tunisian activists as they fought against a brutal and highly oppressive regime. Prior to the ousting of Zineal-Abidine Ben Ali by an unprecedented people’s uprising on January 14, there seemed to be no end in sight to the regime’s wide-ranging human rights violations. Over time, these became a relegated segment of evening news across the Arab world. Even hunger strikes, shocking at first, became a routing event. For Tunisians, unemployment, poverty and lack of civil liberties have long made life intolerable. Many were forced to flee the country, or dare challenge the authoritarian rule of Ben Ali and his security apparatus, which grew in numbers to double – or even triple – the nation’s army. While Tunisia may not have appeared the most likely location for a successful popular rebellion, the country always had the potential of hosting one of the most active civil societies in the Arab Maghreb countries. This was what prompted Ben Ali and his regime to dedicate much time and energy into weakening and largely dismantling a once thriving, diverse and highly educated civil society. The society expressed itself through three main pillars: labor unions, the Islamic movement, and a strong student body throughout the country. When Tunisia gained independence from France in 1957, the country was rife with hope and expectation. The anti-colonial fervor that gripped the country produced an active civil society who wished to move from a French sphere of influence into a nationalistic one. The national leader at the time, Habib Bourguiba dared not upset the growing mobilization of the country, and in fact succeeded in using – and later co-opting and manipulating – the mass movement to maintain his control over the country. This lasted for decades, until Ben Ali carried out his “tranquil revolution” and ousted Bourguiba in 1987. But even authoritarianism has its own compelling logic. Ben Ali could do little to mobilize Tunisian society, and his early promises of greater political participation, equality and openness were never translated into real action. Over time, he grew wary of everyone, including the elites, who are usually the bread and better of any authoritarian regime. He quickly began dismantling every component that gave civil society its import and vigor, destroying or restricting unions, enacting draconian measures against political activities that opposed his ruling party, the Democratic Constitutional Rally (RCD), and bending the law and even the constitution to serve his own interests. Ben Ali’s success in maintaining his regime for 23 years hinged on several major strategies. He ensured that the presidential palace was the ultimate center of power, thus denying anyone else the chance to gain popularity outside a closely-knit circle. A system of patronage existed, whereby those who played by the rules were granted tiny spaces to operate and benefit. For example, during the elections of 2004, the Movement of Socialist Democrats (MDS), an ‘opposition party’ actually endorsed Ben Ali’s re-election bid because it helped “complete the process of democratic pluralism”. Other parties, including the Popular Unity Party (PUP), whose former leader Mohamed Bouchiha once competed for the post of the president, also seconded Bin Ali’s bid to “drive the democratic process”. And what about those who refused to play by the rules? The Islamic al-Nahdha party and the Tunisian Community Workers’ Party (POCT) are two such examples. Ben Ali utilized the second set of measurements to contain ‘unruly’ opposition- brutality, crackdowns and torture. The attempt to silence both parties was equally and decidedly brutal, but in 1991 an-Nahdha protest and call for change seemed to spread quickly in universities and working-class neighborhoods. The event signaled a repeat of the rise of the Islamic resurgence in Algeria, and Ben Ali was determined to stifle any rise of Islamic opposition before the phenomenon became too popular. Ben Ali’s violations of human rights – which grew rapidly since the early 1990s -received little chastising from other governments. Various western powers that hailed Ben Ali’s model of political moderation were, of course, fully aware of the bizarre ‘democracy’ underway in Tunisia. However, Ben Ali’s ability to crush dissidents earned him high regard and constant accolades by these very powers, particularly Tunisia’s former colonizer France. Less than a week after Ben Ali was forced to leave the country, Arab League’s Secretary General Amr Moussa warned Arab countries of the possibility of more Tunisia-style revolutions should their policies remained unchanged.”The Arab soul is broken by poverty, unemployment and general recession…The political problems, the majority of which have not been fixed…have driven the Arab citizen to a state of unprecedented anger and frustration,” he said. 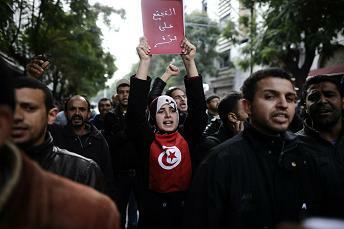 In Tunisia that ‘unprecedented anger” has reaped unprecedented results, leaving Tunisia with the great task of rebuilding a civil society that was weakened, demoralized and purposely disjointed by a calculating and oppressive regime. The prospects for freedom are now greater than ever in Tunisia. Despite the many challenges ahead, this is a serious cause for celebration.